Here's the first stage in our attempt to produce electricity from the sun - these are the solar panel frames that have been put up on the roof of the big barn over the last two days. You may notice that the barn roof is wet. I think that is the god of the weather you can hear in the background, sniggering at our temerity. This time last year I was saying "This time next year..." a lot and imagining picking our own vegetables and putting them by for the winter. The produce that we're getting from the garden has really gone beyond my most optimistic hopes. I know I've put a very similar picture up only a short while ago, but I can't resist showing today's harvest here. It came at a bit of a cost as the solar panel guys had their car stereo on full blast and I had to listen to a Paul Simon album (The Rhythm of the Saints, I think) while I gathered in my crop. If I'd wanted to listen to music from other people's cars while I gardened I would have stayed in Manchester and got an allotment on a busy road instead of moving to the country. Though I probably wouldn't have got as many tomatoes. I love seeing the solar panels going in. Wow, great harvest. Don't reckon you'd ever have got one as good as that in rainy Manchester...! 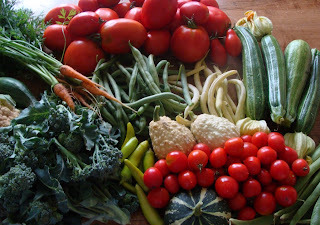 If my harvest looked like that I'd put it up every day. That's what I was going to say - same as Daphne! And the solar panels look exciting too. A large scale project! How attractive the lettuce foliage looks! But how did you keep away slugs? I will probably regret saying this, Lucy, but I have never seen a slug here. I'm not sure if it's the hot, dry summers (well this one wasn't very hot or dry, but they usually are) or the plentiful supply of frogs here that are responsible for the dearth of slugs. I'm certainly not complaining, though - my garden in Manchester was overrun with them! Good for you, "good citizen thinking of the environment and the future!" Your veggies just look so good! I've got to figure out a way to raise my own veggies. Just can't figure out a way to keep the pets out yet... I can get around the dogs. It's the cat that uses my pots and soil as a litter box I'm concerned about.